FUTURE OF YOUR GREAT MOBILE EXPERIENCE: LESS FEATURES!!??? Weâ€™re a fickle lot at Mobilty site when it comes to shiny new phones. Rish is busy dreaming of the day he can have a PSP phone, Maxie (nickname of Imran Asad at Technonix) is busy working out what he can buy from Sprint, Hunt is thinking about Google Phones , and a large chunk of the news team are working out how they are going to manage to wait for the TyTn II. But all of these phones have a major design flawâ€¦ Not one of them is Beer proof. In fact any â€˜beer related incidentâ€™ isnâ€™t likely to be covered by the standard warranty and may cost a bundle of cash to fix. Enter the Alcatel E201â€¦ the best phone in the world to take to the pub. Itâ€™s range of features is impressive. Sounds strange…huh? but it won’t if you had read a survey report by FAME (Forum to Advance Mobile the Experience), which said back in March that mobile users have got too fed up with too many feature and maintenance of expensive high-end phones. The immediate solution that seemed was either the mobile companies devise an easy interface to complement and access all cool features of these phones or else we get back to good old days of only talk and text. 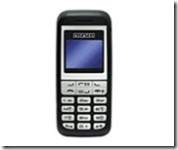 The Alcatel has done the same thing by giving us a cheap and better-usability phone. Pretty much all you can do with it is talk and text. But itâ€™s killer feature is the price.. Â£8 from Woolworths.. on a PAYG tariff. So if you loose it/break it/get it stolen/drop it in a pint of Guinness/Throw it at the annoying karaoke singers.. It doesnâ€™t matter.